Hi, my name is Bailey. 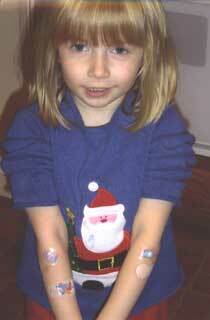 I just turned 8 years old and I have had Type 1 Diabetes for three years now. I was diagnosed with the disease on December 12, 2003. I am in the third grade and I am homeschooled. Homeschooling rocks! I have an adorable younger brother and an apricot toy poodle named after my favorite math person, Sophie Germain. I'm a math wiz and I want to be either an ER Doc, Pediatric Endocrinologist, rock star, or a schoolteacher when I grow up. Who knows, maybe I will be the one to finally find the cure for this stinking disease! Before I was diagnosed, my mom noticed that I was wetting the bed a lot and I was drinking a ton of water. I was really cranky and my stomach was always hurting. At first my mom thought I had a stomach bug but soon enough, she put two and two together and she took me to the pediatrician. My grandfather had Type II Diabetes and my mom gets diabetes when she is having kids so she figured out pretty quick that I had diabetes. I went straight from the pediatrician's office to the hospital. Yep, I had it...the big bad "D" word. It wasn't a very Merry Christmas that year. The hospital was a very scary place. I went on a Friday night and it was really overcrowded. Lots of people had the flu that weekend and there were people throwing up left and right in the waiting room. My blood sugar was tested again with the world's largest lancet and it was in the upper 400s. Would someone please tell the ERs to get with the program and buy smaller gauge lancets?! The nurse started an IV and it hurt like crazy. There were no beds on the pediatric floor so I had to wait in the ER until 3:00 a.m. I was exhausted by the time I got a bed. Every now and then a nurse would come and wake me up and test my blood sugar or give me a shot. OUCH! I thought, "What did I do to deserve this?" Around noon the next day, a nurse came with a big box of needles, a blood test kit (glucometer) and a Pink Panther book all about some stinking disease called Type 1 Diabetes. The hospital food was absolutely disgusting. I decided to go on a hunger strike. This was not cool as my doctor was trying to figure out my insulin dosage. I just wanted to go home and start the week all over. I was angry, confused, hungry and bruised up. As an added bonus, I ended up catching the flu from all the sick people in the ER. Over Christmas, I had to revisit the same ER to get another IV for the flu! HO! HO! HO! When I was first diagnosed, I would only let my parents give me my insulin shot on the back of the arm. I was really scared to try a different spot. Well, it's really important that you rotate shot sites often. Your doctor isn't just making this sort of stuff up! After I tried different spots, I figured out that I really didn't even prefer the arms anymore! After a bit, you get used to taking so many shots. If you relax, the shot goes so much easier. I still haven't tried injecting into my abdomen yet. That seems really gross to me. I will work on it though. <--- This was me shortly after I was diagnosed. I was given one of those glucose meters that you can use on your forearm. Supposedly, the thing is pain-free. Well, let me tell you, that thing bruised my arms all up. I insisted on getting a band-aid whenever I tested my blood. I was soon covered in band-aids! Eventually, I switched to blood testing my fingers. OUCH!! No one told me they had 33 gauge lancets. I was using the 30 gauge lancets. There's a big difference! This sounds terrible, but eventually you start to lose the feeling in your fingertips. This is actually a good thing as it really doesn't hurt to test my blood sugar anymore. Every now and again though you hit a funny spot and it does hurt a bit. I have to test my blood sugar at least eight times per day! No kidding! That's 240 times a month -- 2,920 times per year. If I catch a bad stomach bug, I might even have to test every single hour. My parents even have to test my blood sugar in the middle of the night! That's one bad thing about having Type 1 Diabetes, you never get a break from it. I also have something called hypoglycemic unawareness. Sometimes my blood sugar gets dangerously low and I can't even tell. If I get too low, I could have a seizure. I have never had a seizure yet. There is always a chance that this will happen so I always make sure I carry emergency sugar with me and my glucagon kit is only a few steps away. I also make sure that I'm wearing my medic alert bracelet at all times. This is important and I'm sure the nurse told you this, but make sure you use an alcohol swab before you test your blood sugar! Here's a fun experiment: Pick up a jelly bean and roll it around your fingers. Now test your blood sugar without using alcohol first. Test one of the fingers that rubbed all over the jelly bean. I bet you will get a higher than normal blood sugar reading. Now, wipe your finger really good with an alcohol pad and test your blood sugar again. I bet the number went down some. Can you figure out why this is important?! You certainly don't want to test your blood sugar and get a freakishly high reading and then give yourself insulin based on that number. You might end up crashing! Before I got my Minimed insulin pump last March, I had to take seven shots of insulin a day just to stay healthy. That's a whopping 2,555 shots per year. My insulin pump makes my life a lot easier. I don't have to live by the diabetic clock anymore. I can sleep in now! Before, I had to get up everyday at the same time to take my first shot. Now, I do a site change for the pump every 2-3 days so there are way less shots. My blood test meter transmits my blood sugar number to the pump and then I enter into the pump the number of carbs I plan on eating. The pump calculates the insulin dose and then I okay it. The insulin is dispensed from the pump through a tiny tube that is hooked to one of my limbs. At first, it is really annoying having a tube coming out of you at all times, but after a bit you just get used to it. I don't really notice it is there. FYI: My record for the most insulin pump site changes per one day is THREE!! That's a lot, isn't it? If you go swimming a lot over the summer sometimes the site just won't cooperate and stay put. If you don't already have a special numbing creme called Prilocaine/Lidocaine, get some! You must have a prescription to get it. I put some on my site change site about 20 minutes before the shot, and it totally numbs up the area. I'm not freaking out over the big shot. Also, this creme really comes in handy if you have to go to the hospital to get an IV. Just numb up the IV site while your mom or dad is filling out the insurance paperwork. The IV won't hurt at all! Your Pediatric Endocrinologist: Friend or Foe? If you didn't automatically think, "friend", it's time you found a new endocrinologist. You should enjoy seeing your Pediatric Endocrinologist! Seriously, you have to see this person every three months. They have a really tough job. It is our job to help them out by taking great care of ourselves. So, if your doc bugs you about your blood sugar numbers, it's because he cares about you. He doesn't want you to suffer any complications. I really like my Pediatric Endocrinologist. I know that if I have to call him at 3:00 a.m. with a question, he really won't mind. My doctor even walks in our JDRF fundraising walk. Medic Alert Bracelets: How to Save Yourself Some Bucks Deluxe! Medic Alert bracelets for kids cost an arm and a leg. Don't fall into that trap. My mom bought me one of those really expensive ones once. Well, wouldn't you know it? I lost that bracelet within a week! Now my mom buys the medic alert engraved plates from various places. She usually finds them for cheap on EBAY. She took a beading class at a Michael's Craft Store to learn how to make the beaded part so that the bracelet wouldn't fall apart. Why buy a a bracelet for $60 and up when you can make the same thing for a fraction of the cost? You can find really cool beads just about anywhere nowadays. Take a class, buy yourself some beads, and then make your own bracelets. One bracelet takes all of four minutes to make. My mom is working on a webpage for totally craft-challenged folks on how to make the bracelets. Seriously, anyone can make them! Keep checking this webpage for more information. "If you would only try this herb or this diet, you will be cured." Nothing cures Type 1 yet! Seriously, if it were that easy, don't you think millions of diabetics would throw out their needles right now?! Do you think I enjoy taking so many shots?! Also, please don't tell me about a book on Amazon or a website that claims to cure diabetes. If it were a legitimate cure, don't you think that author would have won the Nobel prize by now? "You are so skinny! How come you got a fat person's disease?" Remember, Type I Diabetes usually strikes the fittest of children. For a great website that explains the various types of diabetes, please visit Islets of Hope. "My kids won't ever get Type I Diabetes. We follow a raw foods diet. My kids have never set foot in a fast food restaurant." Well, it's great that you follow such a healthy diet. However, I know of 2nd generation raw food Type 1 Diabetics. No diet will cure or prevent Type 1. Period, end of story! Doctors really don't know why some kids develop Type 1 Diabetes. They think it is a combination of genetics and environment. I am the first person in my family to develop Type 1. Lucky me! "Don't worry! You will grow out of it!" No, I won't. There is no cure for Type 1 Diabetes at the moment. Until there is a cure, I will have this disease for the rest of my life. Insulin is NOT a cure. It does not fix my pancreas. It's just a medication to control the diabetes. Super Important: If you don't have a 504 Plan or an IEP for your Type 1 Diabetes, GET ONE! Basically, my 504 Plan states that I can test my blood sugar whenever/wherever I want. I can reschedule standardized tests if my blood sugar is not in range. I can also have more time on tests so that I may test my blood sugar and eat a snack if necessary. I'm allowed to carry my blood test kit, cell phone and emergency sugar with me at all times. Even if you think you won't need a 504 Plan or IEP, I can't urge you enough to get one. There are plenty of examples online. The wonderful folks at childrenwithdiabetes.com have lots of links for plans. If you are ever been discriminated against in school because you have diabetes, contact someone in your local American Diabetes Association office as soon as possible. 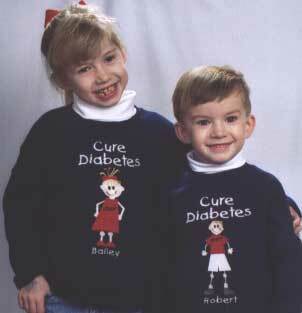 Unfortunately, discrimination against diabetic children happens all the time. It needs to be stopped! If you have been discriminated against in a California public school because of your diabetes, please contact the Disability Rights Education and Defense Fund. A class action lawsuit against the California Department of Education is in the works right now. I've actually been turned away from some private schools because of my diabetes. I've even had a public school tell me, "Take your diabetic problem somewhere else." I kid you not. This sort of stuff doesn't need to happen! If it happens to you, contact a legal authority as soon as possible. I did have some lovely little schoolmates last year that made fun of me for having "diabetes germs." Those girls upset me so much that I ended up eating a lot of my lunches with the school nurse. Looking back, I realize that these girls were just plain old mean and I'm sure if they weren't making fun of me for having diabetes, they would have made fun of me for something else. Some kids are just rotten to the core! If something like this happens to you, make sure you tell someone right away. This is just plain old RUDE! There's a great little book called Taking Diabetes to School. I would say it is written for the fourth grade and under crowd. Your diabetes educator might even have a copy she could loan or give you. Make sure your teacher reads it to the entire class so that the class understands exactly what Type 1 Diabetes is and isn't. You certainly can't give off diabetes germs. DUH!!! You know what's one way cool thing about having Type 1 Diabetes? You get to go to Diabetes Camp! I go to one every summer called Camp Wana Kura. It's a blast! I've gone for two years now. I wouldn't miss camp for anything. Go to your American Diabetes Association website and see if there is a camp near you. <--- My brother and I really want a cure. Did you know you can help find a cure for diabetes? The Juvenile Diabetes Research Foundation (JDRF) sponsors fundraising walks all the time. The walks are a lot of fun. Okay, you have to get up ridiculously early for them but that's the only bad part about them. Your school can even sponsor a fundraising walk. You can call the JDRF and they will send you a fundraising kit to give to your school. 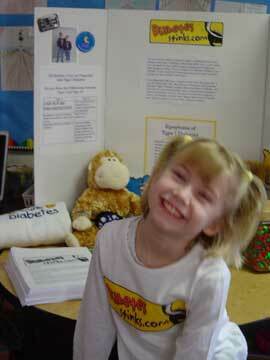 You can apply every two years for "Promise to Remember Me - Kids for a Cure Campaign" through JDRF. I participated in this in 2005. I actually spent a week on Capitol Hill and lobbied Congress for more federal funding for diabetes research. The deadline for the 2007 application has passed, however, you can always apply in the future for the 2009 Congress. I highly recommend this experience to anyone! 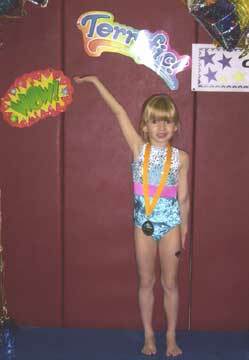 <--- Getting my gymnastics award. Having Type 1 Diabetes does really stink at times! You do get used to it after a while, and it does get easier! Just remember that you did nothing to get Type 1. Your pancreas just decided to go all haywire. No one really understands why this happens. Hopefully, we'll have all the answers soon and we can throw out all the test strips and needles. If you ever have any questions, have your mom or dad post on the forum for Parents of Children with Type 1 here. I'm not affiliated with them in any way, however, I know if I have a question, I will get an answer right away. If you have questions about insulin pumps, types of insulin, crazy blood sugars, or you just need to vent about how diabetes stinks at times, it's a great place to hang out! I would also recommend finding a local support group. My group meets once a month. The kids all play and run around like crazy while the parents talk. From Bailey's mom: Bailey is homeschooled after her last school blatantly violated her 504 Plan for her diabetes. Bailey is homeschooled through a wonderful charter school. The school is very supportive and Bailey adores all of her classmates. Every year, the children at the charter school work on community service projects. Bailey wanted to do a webpage for kids with Type 1 Diabetes as part of her project. These are pictures of Bailey giving her presentation at school. On the photo on the left, she is working on another one of her websites. Bailey did all the HTML work on this website all by herself! I helped with the words on this webpage. What I know about HTML I could write on a postage stamp! 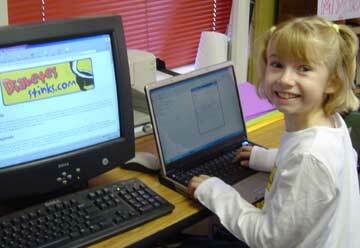 Bailey used two books to help with the HTML: A Kid's Guide to Creating Web Pages and Web Design for Teens. I highly recommend both books. The DiabetesStinks.com logo was designed by Amara's way cool mom, Melissa. Bailey met Amara at diabetes camp and they fast became best buds. They even have the same color insulin pump: purple! Amara is an aspiring actress and star of many way off-Broadway Boston play productions. Recently, she played Linus in You're a Good Man, Charlie Brown. Amara has had Type 1 since she was three years old and she has not let her diabetes slow her down one bit. Send questions or comments to info@diabetesstinks.com.